Feigenbaum Dental is committed to creating beautiful smiles with a gentle touch. In addition to dental care, we also provide treatment for sleep apnea. Through our mission of oral health excellence, we strive to provide the best techniques and advancements to provide the most comprehensive and effective services. Keeping in stride with our vision, we proudly offer treatment for chronic snoring and obstructive sleep apnea using the EMA appliance. We provide the sleep apnea oral appliance in Creve Coeur as an alternative to other apnea treatments to safely and effective reduce the symptoms and complications of apnea. The EMA appliance (Elastic Mandibular Appliance) has quickly become the preferred oral appliance for treating sleep apnea because it offers many customizations and innovations for comfort and successful treatment. Unlike other oral appliances available, the EMA appliance allows the airways to stay open without restricting jaw movements for enhanced comfort. Plus, it allows for mouth breathing, which is the perfect option for those who also deal with nasal congestions. The benefits of the EMA appliance are possible because it offers 9 different strap lengths and 4 different elastic tension options. This makes the device highly customizable for your exact needs. Using the device, we will customize the device to move the mandibular forward. By moving it forward, the oral pharynx remains open to keep the airways open while sleeping. The increased airflow not only reduces chronic snoring, but the interruptions in breathing caused from sleep apnea. Although the mandibular is moved forward and held in place by the device, it doesn’t restrict jaw movement. The elastic tension bands allow you to maintain full lateral and protrusive movements of the jaw for enhanced comfort. The free movement of the jaw makes the device less restricting—perfect for those who dislike other oral devices or CPAP machines. 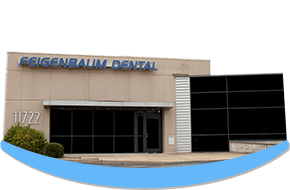 Feigenbaum Dental is fully committed to our patients by delivering the most comprehensive care possible, even for those with sleep apnea. While you may think that snoring is normal, it is a sign of sleep apnea, which requires treatment. When left untreated, sleep apnea causes your sleep quality to diminish. Over time, you’ll not only notice your ability to get a restful night’s sleep becomes more challenging, but your day-to-day life as well. Your ability to function performing simple daily tasks becomes more difficult. In addition, your overall health will be impacted as the lack of airflow and sleep causes havoc throughout the body. You’ll develop an increased risk for stroke, heart disease, and many other complications. As your caring dentist in Creve Coeur, MO, we encourage you to seek treatment for sleep apnea to protect your health and quality of life. If you suffer from chronic snoring or suspect you may have sleep apnea, we encourage you to take a moment to take our Sleep Apnea Quiz, which includes a free consultation at our office if you are at risk. We will provide the correct course of treatment to keep the airways open using the EMA appliance. For treatment using a sleep apnea oral appliance in Creve Coeur, contact our office today at (314) 596-9608.